I've just watched that movie, and I got a cool idea. Let's make a kingdom filled with 300 strong skilled veterans! I mean, we could totally own the Persians if they'd come. I think. And I mean, we'd be Spartans so we could build walls from the armies we kill. Hax, you know! Sign up here with a proper application! with ~200 players online at the same time on regular basis... I don't think there is 300 veterans, not even 100 :( let's bring this suggestion back in 5 years. This is not the kind of behaviour I expect from Spartans! You must be Persians! 300 Stong guys! We do not accept women in our army! can i be the retard? 4/22/2008 5:30:56 PMcan i be the retard? 4/22/2008 4:23:09 PMThis is not the kind of behaviour I expect from Spartans! You must be Persians! 4/22/2008 4:23:09 PM This is not the kind of behaviour I expect from Spartans! You must be Persians! What do you class as vets. 25+ eras of play? You only have to arrogant to be a vet, skill isn,t important just a big mouth will do. 300 Spartans vs 100 nublets? That circumstance would be perfect! YES BRILLIANT! I'll play the part of those 100 nublets! Yes, my multi. I see your plan.....good job Multi Seloc. 4/23/2008 5:30:02 AM You only have to arrogant to be a vet, skill isn,t important just a big mouth will do. Freakin A, no women? I'm outta here. 4/24/2008 1:02:43 AM Freakin A, no women? I'm outta here. Looks like someone saw this coming! Lol.. 3 players in a kd reminds me of The three musketeers of Hankypanky's first kd..
LMAO, absolutely horrible idea, but if this were to be done the ratio would need to be much larger anyway. The exact numbers are not known but a conservative estimate puts the persian to spartan/greek ratio at 100:1.
r u stupid wat kind of maths is that!! !.......the freakin spartans were maki walls out of bodies!..........remeb the persian dude said "the armies of a 1000 nations descend upon u"! Wait my bad....I meant that only 40,000 Persians went up against that force of Spartans (and others)in the pass they were holding. It was a secret way that the Persians found out from men they captured. They were going to slip behind the Athenian army that had destroyed all assaults from the front so they were going to go through a way around. Thats where the Spartans come in. They decided to hold that secret way until everyone had fallen back and regrouped. haha the movie 300 (dont get me wrong cuz it is also one of my most favorate movies) is not very historically accurate. Exact numbers are still not known of the entire persian force, all that ppl can do is speculate from the few different sources where the numbers have been passed down through stories and recorded (therefore leaving alot of room for exaggeration and errors in the true number). @ Orcinus "the armies of a 1000 nations descend upon u"-- no where does that give a number of the size of the persian force! "there for i wud say a modest estimate wud put the persian at 500k troops divided by 300 it wud b a ratio of "-- LMAO just because you have seen the movie, in no way does it justify you to be able to put an estimate an the numbers of a battle that happened (I am not saying that your estimate is wrong but becareful of your wording =P). Thanks for proving my point on this Charley and Killstone! As I said, the numbers I used are CONSERVATIVE numbers of what were used in the battle at Thermopylae. Yes the persians only used about 40,000 of their troops at this battle but the point is that they had the entire persian force to use, but they only ended up needing the 40k to win it. Because of that fact, a conservative estimate of the persians to Greek/Spartans is 100:1. There is no denying that Spartans were the best warriors and they do deserve the glory of leading the stand to the death at Thermopylae, but dont think for a second that they would have lasted as long as they did without the 5000+ other Greek volunteers who stayed behind to fight alongside them. DONT BELIEVE EVERTHING YOU SEE IN MOVIES! 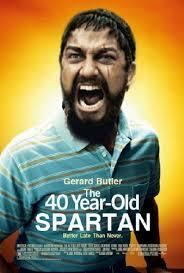 Meet the Spartans is a way better movie!